Leah Hogsten | The Salt Lake Tribune A 50-acre wildfire in Rose Canyon was threatened about a half-dozen homes Wednesday, Sept. 12, 2018. A spokesman for Unified Fire said the blaze has already burned a few structures, including outhouses and sheds. Firefighters have evacuated around 20 to 30 homes in two neighborhoods near 15555 S. Rose Canyon Road in Herriman. 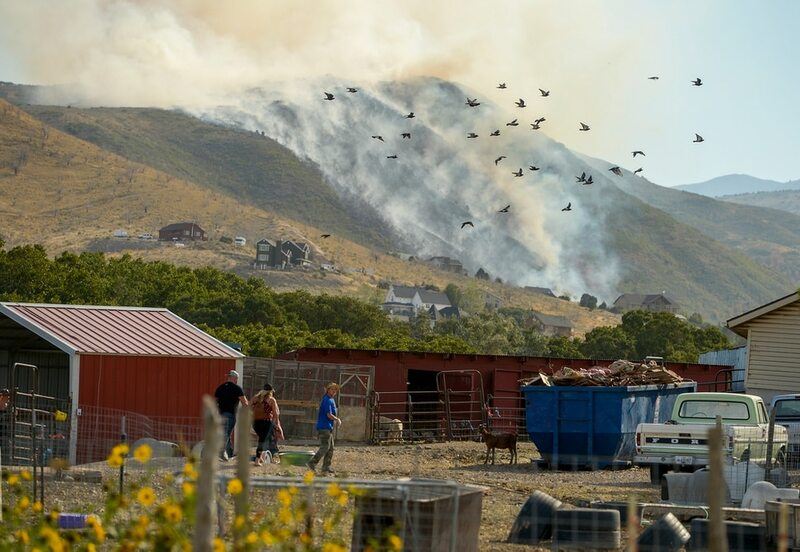 A wildfire in Rose Canyon in southwestern Salt Lake County that sparked and grew to more than 70 acres on Wednesday had stopped spreading by evening, and Unified Fire officials said they were confident they could contain the blaze on Thursday. The fire had threatened about a half-dozen homes Wednesday afternoon and burned a few structures, including outhouses and sheds. Firefighters evacuated three neighborhoods near 15555 S. Rose Canyon Road in Herriman, and though much of the risk was over, they kept the evacuation order in place Wednesday evening to keep traffic congestion from disrupting firefighting efforts. The evacuation order was lifted around 9 p.m. and roads were reopened. “We’re on the downswing of things,” a Unified Fire spokesman said early Wednesday evening. Leah Hogsten | The Salt Lake Tribune A 50-acre wildfire in Rose Canyon was threatened about a half-dozen homes Wednesday, Sept. 12, 2018. A spokesman for Unified Fire said the blaze has already burned a few structures, including outhouses and sheds. Firefighters have evacuated around 20 to 30 homes in two neighborhoods near 15555 S. Rose Canyon Road in Herriman. 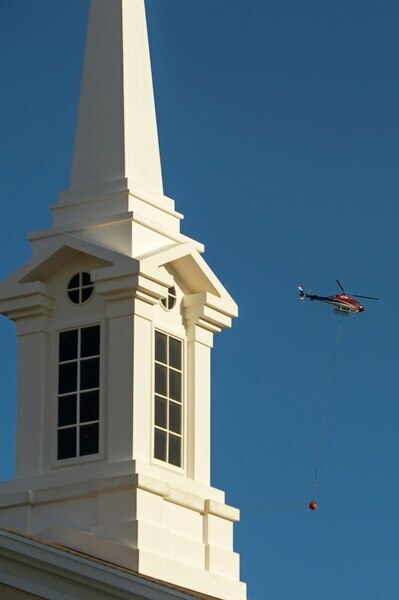 Leah Hogsten | The Salt Lake Tribune A firefighting helicopter refills with water near Herriman Cove pond. A 50-acre wildfire in Rose Canyon was threatened about a half-dozen homes Wednesday, Sept. 12, 2018. A spokesman for Unified Fire said the blaze has already burned a few structures, including outhouses and sheds. Firefighters have evacuated around 20 to 30 homes in two neighborhoods near 15555 S. Rose Canyon Road in Herriman. Leah Hogsten | The Salt Lake Tribune Homeowners who were not allowed to return to their homes and onlookers waited near Herriman Cove pond and park. A 50-acre wildfire in Rose Canyon was threatened about a half-dozen homes Wednesday, Sept. 12, 2018. A spokesman for Unified Fire said the blaze has already burned a few structures, including outhouses and sheds. Firefighters have evacuated around 20 to 30 homes in two neighborhoods near 15555 S. Rose Canyon Road in Herriman. Leah Hogsten | The Salt Lake Tribune Homeowners who were not allowed to return to their homes and onlookers waited near Herriman Cove pond to watch as a firefighting helicopter refilled. A 50-acre wildfire in Rose Canyon was threatened about a half-dozen homes Wednesday, Sept. 12, 2018. A spokesman for Unified Fire said the blaze has already burned a few structures, including outhouses and sheds. Firefighters have evacuated around 20 to 30 homes in two neighborhoods near 15555 S. Rose Canyon Road in Herriman. Leah Hogsten | The Salt Lake Tribune l-r Martin Garcia, Colby Lovendahl, 8, and Danny Lovendahl of Herriman watch as the blaze burns 1/4mile from their home. They waited for hours to be allowed to get back to their wives and children who did not leave the home as the fire burned. A 50-acre wildfire in Rose Canyon was threatened about a half-dozen homes Wednesday, Sept. 12, 2018. A spokesman for Unified Fire said the blaze has already burned a few structures, including outhouses and sheds. Firefighters have evacuated around 20 to 30 homes in two neighborhoods near 15555 S. Rose Canyon Road in Herriman. Leah Hogsten | The Salt Lake Tribune Danny Hill and his children l-r Zac, 6, Owen, 5, and Leah, 2, watch as a helicopter gets water from Herriman Cove pond and wait for mom to call them home for dinner. Homeowners who were not allowed to return to their homes and onlookers waited near Herriman Cove pond to watch as a firefighting helicopter refilled. A 50-acre wildfire in Rose Canyon was threatened about a half-dozen homes Wednesday, Sept. 12, 2018. A spokesman for Unified Fire said the blaze has already burned a few structures, including outhouses and sheds. Firefighters have evacuated around 20 to 30 homes in two neighborhoods near 15555 S. Rose Canyon Road in Herriman. Leah Hogsten | The Salt Lake Tribune A firefighting helicopter refills with water near Herriman Cove pond. A 50-acre wildfire in Rose Canyon was threatened about a half-dozen homes Wednesday, Sept. 12, 2018. A spokesman for Unified Fire said the blaze has already burned a few structures, including outhouses and sheds. Firefighters have evacuated around 20 to 30 homes in two neighborhoods near 15555 S. Rose Canyon Road in Herriman. 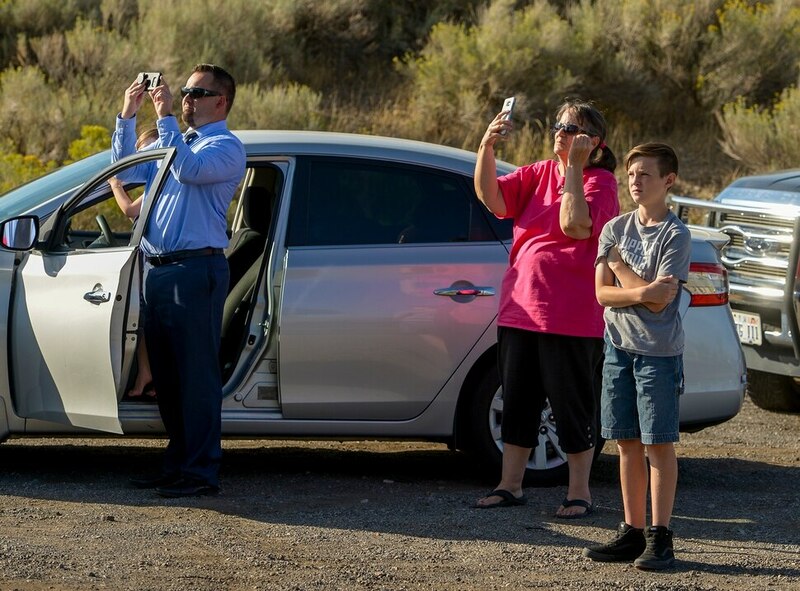 Leah Hogsten | The Salt Lake Tribune Homeowners who were not allowed to return to their homes and onlookers waited near Herriman Cove pond to watch as a firefighting helicopter refilled. A 50-acre wildfire in Rose Canyon was threatened about a half-dozen homes Wednesday, Sept. 12, 2018. A spokesman for Unified Fire said the blaze has already burned a few structures, including outhouses and sheds. Firefighters have evacuated around 20 to 30 homes in two neighborhoods near 15555 S. Rose Canyon Road in Herriman. Leah Hogsten | The Salt Lake Tribune Homeowners who were not allowed to return to their homes and onlookers waited near Herriman Cove pond to watch as a firefighting helicopter refilled. A 50-acre wildfire in Rose Canyon was threatened about a half-dozen homes Wednesday, Sept. 12, 2018. A spokesman for Unified Fire said the blaze has already burned a few structures, including outhouses and sheds. Firefighters have evacuated around 20 to 30 homes in two neighborhoods near 15555 S. Rose Canyon Road in Herriman. Leah Hogsten | The Salt Lake Tribune Homeowners who were not allowed to return to their homes and onlookers waited near Herriman Cove pond to watch as a firefighting helicopter refilled. A 50-acre wildfire in Rose Canyon was threatened about a half-dozen homes Wednesday, Sept. 12, 2018. A spokesman for Unified Fire said the blaze has already burned a few structures, including outhouses and sheds. Firefighters have evacuated around 20 to 30 homes in two neighborhoods near 15555 S. Rose Canyon Road in Herriman. Leah Hogsten | The Salt Lake Tribune Martin Garcia of Herriman watches as the blaze burns 1/4mile from his home. Garcia waited for hours to be allowed to get back to his wife and children who did not leave their home as the fire burned. A 50-acre wildfire in Rose Canyon was threatened about a half-dozen homes Wednesday, Sept. 12, 2018. A spokesman for Unified Fire said the blaze has already burned a few structures, including outhouses and sheds. Firefighters have evacuated around 20 to 30 homes in two neighborhoods near 15555 S. Rose Canyon Road in Herriman. The Red Cross assisted evacuees at Butterfield Canyon Elementary School, and Salt Lake County Animal Services helped with pets in need. More than 50 firefighters — as well as helicopters and other aircraft — were working to control the blaze. And while high winds and steep terrain were making the fire difficult to fight, fire authorities noted that the flames seem to be moving away from homes. Unified Fire expected to have two crews on the mountain throughout the evening to ensure the fire didn’t spread. Officials were still working to determine the cause of the fire, which they said originated near the homes. Rose Canyon Road was closed west of 7500 West early Wednesday afternoon and students who attend the local Butterfield Canyon Elementary School and live in the area were kept at school until their parent or emergency contact arrived.